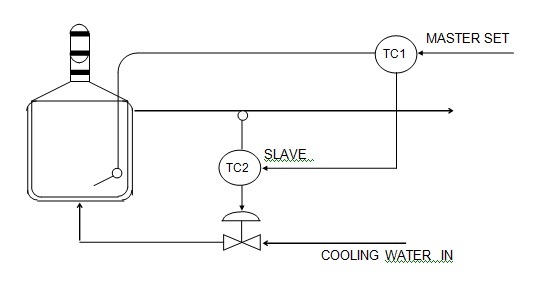 For example in Batch reactor temperature is controlled using Cascade control strategy. The output of temperature controller TC-1 adjusts the set point of TC-2 in the batch reactor control system. The primary variable batch temperature is controlled by the master controller, but not by directly adjusting the cooling water valve. Instead, it manipulates the set point of the slave or secondary controller, which in turn supplies jacket water at the asked for temperature. There are two controlled variables, one manipulated and one independent set point. 1. Reduce the effect on the total control system of the dynamic elements in the secondary loop. 2. Correct for disturbances which occur within the secondary loop before they affect the master loop (such as cooling water temperature changes). The slave controller need have only proportional response. The major time constant must not be in the slave loop. Cascade control is normally not applied in fast control loops – flow, pressure, etc. It is more useful in temperature or composition control systems.